The Sacramento Chapter meets on the first Thursday of each month. We start gathering at 11:30 and place our orders around noon. Very informal gathering focusing on sharing sea stories and untold stories of the FBI. 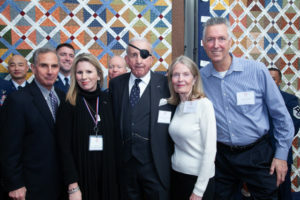 Col John C. McKay, USMC(Ret), was the Guest of Honor at the annual California Gold Star Mothers/Parents Honor and Remembrance formal dinner given on Friday, 22 February 2019, at the Marine’s Memorial Association and Foundation in San Francisco. The event consisted of over two hundred mothers, parents, spouses, and/or siblings who have lost immediate family members serving on active military duty at the time of their deaths. PRESENTING THIS YEAR’S AWARDS IS COLONEL JOHN MCKAY, UNITED STATES MARINE CORPS, RETIRED. REARED IN LATIN AMERICA, AT AGE SEVENTEEN (17) COLONEL MCKAY ENLISTED IN THE UNITED STATES MARINE CORPS. HE WAS APPOINTED FROM THE RANKS TO THE U. S. NAVAL ACADEMY IN 1964. TWICE WOUNDED IN VIETNAM HE WAS RECOGNIZED FOR VALOR. NOT WITHSTANDING THE LOSS OF AN EYE HE REMAINED IN THE MARINE CORPS, COMMANDING INFANTRY UNITS AT EVERY RANK. AN OLMSTED SCHOLAR HE STUDIED TWO YEARS AT THE UNIVERSITY OF MADRID, SPAIN. HE WAS NAVAL ATTACHÉ IN EL SALVADOR DURING THE CIVIL WAR. HE SUBSEQUENTLY COMMANDED AND DEPLOYED A USMC INFANTRY BATTALION TO THE INDIAN OCEAN. HIS LAST COMMAND, AS A COLONEL, WAS JOINT TASK FORCE 160 (JTF-160) AT GUANTÁNAMO BAY, CUBA. IN THE LATTER CAPACITY HE NEGOTIATED DIRECTLY WITH THE COMMUNIST GOVERNMENT OF CUBA. WHILE ASSIGNED TO NATO HEADQUARTERS HE SERVED ON THE UN STAFF OF FRENCH GENERAL PHILIPPE MORILLON IN SARAJEVO. UPON RETIREMENT COLONEL MCKAY WORKED FOR THE CIA IN PALESTINE AND LATIN AMERICA. HE WAS SPECIAL ASSISTANT TO THE U. S. SPECIAL ENVOY FOR MIDDLE EAST REGIONAL SECURITY (IN JERUSALEM). HE RECENTLY FINISHED WORKING MÉXICO AND CENTRAL AMERICAN ISSUES FOR THE U. S. DRUG ENFORCEMENT ADMINISTRATION (DEA). SINCE 2016, HE HAS BEEN AN ADJUNCT PROFESSOR AT CALIFRONIA STATE UNIVERSITY, SACRAMENTO, LECTURING ON GEOGRAPHY OF LATIN AMERICA, AND ON GEOGRAPHIES OF THE MIDDLE EAST AND LEVANT. HE HOLDS MASTER DEGREES FROM GEORGETOWN UNIVERSITY AND THE NATIONAL WAR COLLEGE. COL MCKAY CONSULTS ON LATIN AMERICAN ISSUES AND CONTINUES TO WRITE ON SOCIAL, CURRENT, AND HISTORIC TOPICS. HE IS MARRIED TO THE FORMER MARGO PACE; THEY HAVE THREE SONS (ALL VETERANS). THANK YOU, GENERAL HULY. CONTRARY TO WHAT THE GENERAL HAS JUST RELATED, I WAS VERY KIND TO HIM WHEN HE VISITED ME AT HQMC. IN POINT OF FACT, I WAS KNOWN AS THE ‘FRIENDLY INFANTRY MONITOR’! GENERAL MYATT, YOUR EFFORTS AND SIGNIFICANCE IN MAKING THIS ALL-IMPORTANT EVENT POSSIBLE ARE BOTH RECOGNIZED AND DEEPLY APPRECIATED. THANK YOU, SIR. GOLD STAR MOTHERS, GOLD STAR PARENTS, I AM HUMBLED BEFORE THE MAGNIFICENCE OF YOUR COURAGE AND FORTITUDE. YOU HAVE DONE ME A GREAT HONOR. WE LIVE IN A SOCIETY THAT SKIRTS AROUND SPEAKING OF GRIEF, EVEN MORE SO, OF DEATH. ALL OF YOU ARE POIGNANTLY ENDURING ONE OF THE MOST TRAGIC EVENTS IN ANY PERSON’S LIFE. YOU ARE ALL IN A DARK, RAW PLACE. THE MEANINGLESS FLUTTER OF PLATITUDES, THE MISPLACED FOCUS OF AWKWARD PROFFERING OF CONDOLENCES IN THE GUISE OF OTHERS’ OWN – ALMOST UNIVERSALLY MINOR – TRIALS AND TRIBULATIONS, MORE OFTEN THE FUMBLING OFFERINGS OF INSENSIBILITIES THAT NEITHER GRASP NOR CAN EVEN BEGIN TO APPRECIATE YOUR ACUTE PAIN. THESE GESTURES, WELL MEANING IN PRINCIPLE, OFFER SCANT RECOGNITION THAT YOU, ALL OF YOU, ARE IN AN UNKNOWN AND TERRIBLE TWILIGHT FROM WHICH YOU WILL NEVER ENTIRELY EMERGE. YOU ARE LITERALLY TRANSFORMED, FOREVER CHANGED. AND, LET’S BE HONEST, THE CHANGE IS LIFE LONG AND NOT ALWAYS PROPITIOUS. IT IS TRUE THAT SOME DEGREE OF REDEMPTION FROM, A COMING TO GRIPS OF SORTS WITH, THE MORTALITY OF YOUR DEARLY BELOVED; AND, YES, WITH YOUR VERY OWN MORTALITY, DOES OCCUR. THAT IS BUT MEAGER COMFORT, MUCH LESS ANY RECOMPENSE FOR, THE IRREPLACEABLE LOSSES YOU HAVE SUFFERED. YOU HAVE AN ABSOLUTE RIGHT TO WHATEVER YOU ARE FEELING, AND WHENEVER YOU ARE FEELING THOSE FEELINGS. IT IS CORRECTLY SAID, “TO WEEP IS TO MAKE LESS THE DEPTH OF GRIEF.” ABSOLUTELY NO ONE CAN, NOR SHOULD THEY EVER TRY TO, DENY YOU YOUR DEPARTED LOVED ONES. THEY ARE THE CHILDREN YOU LOVINGLY BROUGHT INTO THE WORLD AND UNFAILINGLY STOOD BY, THE LOVED ONES YOU WILL FOREVER CHERISH, AND WHOM YOU SO LOVINGLY ADORED. EACH AND EVERY ONE OF THEM HAS BEEN VICIOUSLY RIPPED FROM YOUR ARMS, VIOLENTLY TORN FROM YOUR SIDES, UNFORGIVINGLY RENDERED FROM YOU FOREVER, PHYSICALLY REMOVED FROM YOUR UNDYING ADORATION, FROM AN INDISCERNIBLE EMOTIONAL AND PHYSICAL DEVOTION OF UNFATHOMABLE DEPTH. YOU ARE DRIVEN UPON YOUR KNEES BY THE OVERWHELMING CONVICTION THAT YOU HAVE NOWHERE TO GO. THE HEART OF GRIEF, ITS MOST DIFFICULT CHALLENGE, IS NOT “LETTING GO” OF THOSE WHO HAVE DIED BUT INSTEAD MAKING THE TRANSITION FROM LOVING IN THE PRESENT TO LOVING IN SEPARATION. IN BEING LOVED AND ALWAYS REMEMBERED THEY ARE FOREVER IN YOUR HEARTS. AND, FROM YOUR HEARTS YOU WILL EVERMORE SPEAK OF THEM. I AM NO STRANGER TO THE LOSS OF LOVED ONES TO ABJECT VIOLENCE. NOR WILL I EVER BE UNBURDENED OF GRIEF. GRIEF IS UNIVERSAL. YET, AND YET, GRIEF IS SO INTIMATELY PERSONAL. HOW WE GRIEVE IS WHO WE ARE. AND, AS WERE YOUR LOVED ONES, WE, EACH AND EVERY ONE OF US PRESENT THIS EVENING, IS A UNIQUE INDIVIDUAL. AND, AS INDIVIDUALS WE GRIEVE INDIVIDUALLY, UNIQUELY, EACH WITHIN OUR OWN PRIVATE SOLITUDE. THAT DOES NOT ASSUAGE THE PAIN, THE REALITY OF ULTIMATE LOSS, BUT IT DOES GIVE DUE TO THE FACT WE ARE EACH HUMAN INDIVIDUALS. THE GRAVE POIGNANCY OF THE GRIEF SHARED WITHIN THIS ROOM PUTS ON VIVID DISPLAY THE INCREASINGLY RARE TYPE OF INDIVIDUAL YOUR LOVED ONES EMBODY AND REPRESENT – YES, I INTENTIONALLY USE THE PRESENT TENSE. FOR THEY HAVE DONE MORE, AND PAID THE ULTIMATE PRICE THROUGH THEIR SACRIFICE, IN UPHOLDING THE UNIVERSAL LEGITIMACY OF HUMANISM. INDIVIDUALS SUCH AS YOUR SONS, DAUGHTERS, SPOUSES, OR SIBLINGS AREN’T SUPPOSED TO EXIST ANYMORE, EXCEPT IN OUR HONEYED REMEMBRANCES OF THE SO CALLED GREATEST GENERATION. YOUR PRESENCE THIS EVENING PUTS A LIE TO THAT TALE. PERHAPS MORE IMPORTANTLY, OUR GATHERING TOGETHER ON THIS EVENING OF HONOR AND REMEMBRANCE UNAPOLOGETICALLY AND OPENLY DISPLAYS A COLLECTIVE EMBRACE OF THE CRITICALLY IMPORTANT SENSITIVITY OF SHARING THAT WHICH ALL BUT DEFIES SHARING. THE VERY COMMEMORATING OF YOUR LOVED ONES LIVES PROVIDES A CLEAR MARKER OF THE SIGNIFICANCE OF EACH AND EVERY ONE OF THEIR SINGULAR PRESENCES ON THIS EARTH. THOUGH WE WALK TOGETHER DOWN AN UNPREDICTABLE, PAINFUL, DRAINING AND EXHAUSTING, PATH WE COLLECTIVELY SEEK HOPE. HOPE HIDES ITSELF. THROUGH OUR GATHERING TOGETHER THIS EVENING, COLLECTIVELY COMMEMORATING OUR LOSSES, WE ARE CHALLENGING HOPE TO ONCE AGAIN SHOW US THE WAY FORWARD. ALLOW STRENGTH FROM LIFE’S SURGES OF THE CRUELEST KIND, CASTE LIGHT UPON THE DARKNESS OF DESPAIR, THROUGH HOPE, FAITH, LOVE AND THE COMMON BOND OF THIS SHARED EVENING. I AM PRIVILEGED BEYOND DESCRIPTION TO HAVE SHARED A FEW MOMENTS WITH YOU. THANK YOU. Photographs from the Annual Gold Star Mother’s Honor and Remembrance Formal Dinner at the Marines’ Memorial Club San Francisco, CA. 22 February 2019. 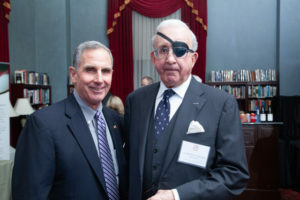 LtGen Jan Huly, USMC (Ret), President & CEO of the Marines’ Memorial Association and Foundation: and, Colonel John C. McKAY, USMC (Ret), Guest of Honor, at California Gold Star Mothers’ Honor and Remembrance evening reception, 21 February 2019. 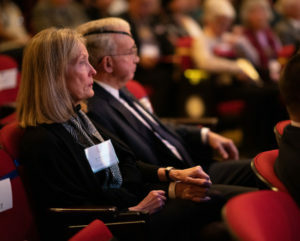 Colonel and Mrs. John C. McKAY, LtGen Jan Huly, USMC (Ret), evening reception, 21 February 2019. 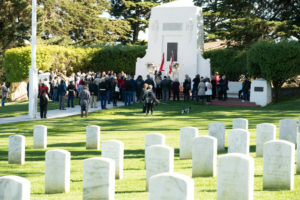 California Gold Star Mothers at “A Celebration of Heroes”, the National Cemetery, Presidio of San Francisco, 22 February 2019. One of the GSM’s families has a service-member son interred at the Cemetery. Colonel and Mrs (Margo) McKAY at the memorial service for the fallen, morning of 22 February 2029. Margo is on the Board of Blue Star Mothers, and is that organization’s official liaison to the Gold Star Mothers.